A few months ago I jumped in to participate in a "Pay it Forward" initiative on Facebook. I posted the information about the initiative on my Facebook status, and the first five people who commented were promised a surprise from me during the year. The whole purpose of the surprise is just to make someone happy and they, in turn, must "Pay it Forward" to five other people, and so on, and so on, forming a web connection of kindness! My dilemma, what could I give as a surprise. The first thing you need to do is trim up the starting end of the rope, so that you can start to roll a disk for the bottom of the bowl. 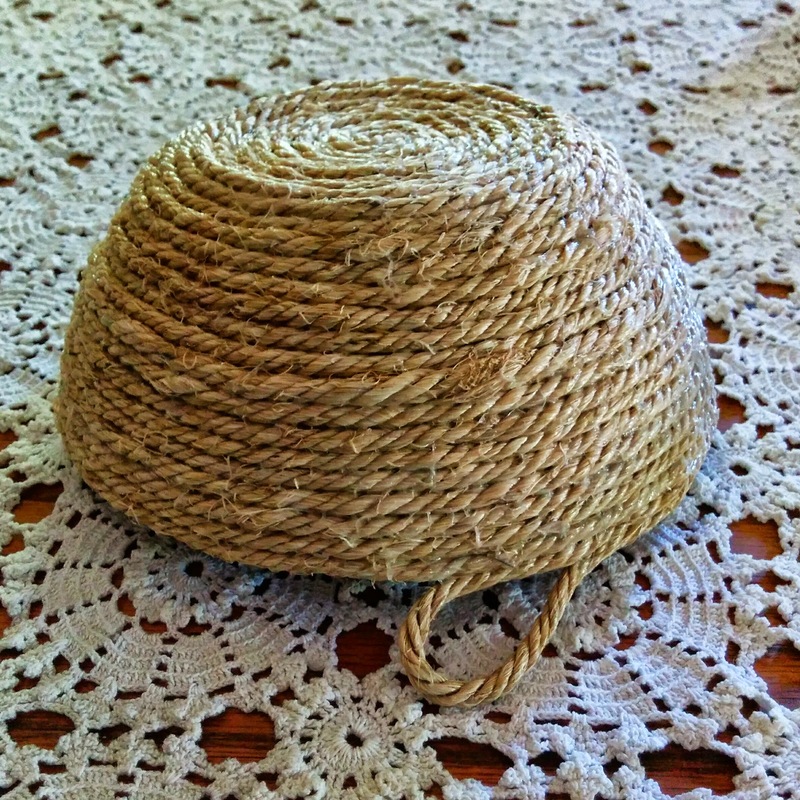 The easiest way is to fold the end of the rope back on itself and use straight pins to hold the rope in place. Keep rolling the rope into a flat disk until it is about 2" in diameter. Use the straight pins as needed to prevent any gaps. Then spread a layer of glue on just one side of the disk. Allow it to dry for about 45 minutes. While the bottom disk it drying, tape a ribbon to the bottom of the bowl you are using as your mold. The ribbon needs to be long enough to reach all the way to the top of both sides of the bowl with about 3" excess on each side. Now, tape the second ribbon on the bottom of the bowl so that it forms a cross with the other ribbon and again make sure it is long enough to reach to top of both sides of the bowl with 3" to spare. When the disk is dry, use the pliers to remove the straight pins. Turn the bowl upside down and lay the dry side of the disk centered on the bottom of the bowl. 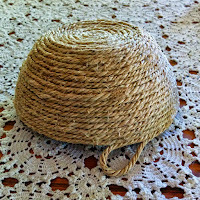 Now start to wrap and coil the rope using the bowl as your guide. I found it worked best when I only did 3 wraps (just an inch) at a time, using the straight pins to prevent any gaps. Once I had completed the 3 wraps, I would coat them on the outside with glue, using my fingers to make sure it was well spread. You need to be careful not to get glue on the bowl, or the rope will stick. Let the section dry and the glue will turn clear when it's dry so you'll know when you can continue. Pull out all of the straight pins with the pliers, and start coiling and pinning the next section. Apply the glue. Let it dry, and remove the pins. Continue this process until you reach the top of the bowl. When you get to the top of the bowl, leave a tail end of rope about 6" long. Remove any remaining straight pins from the rope. 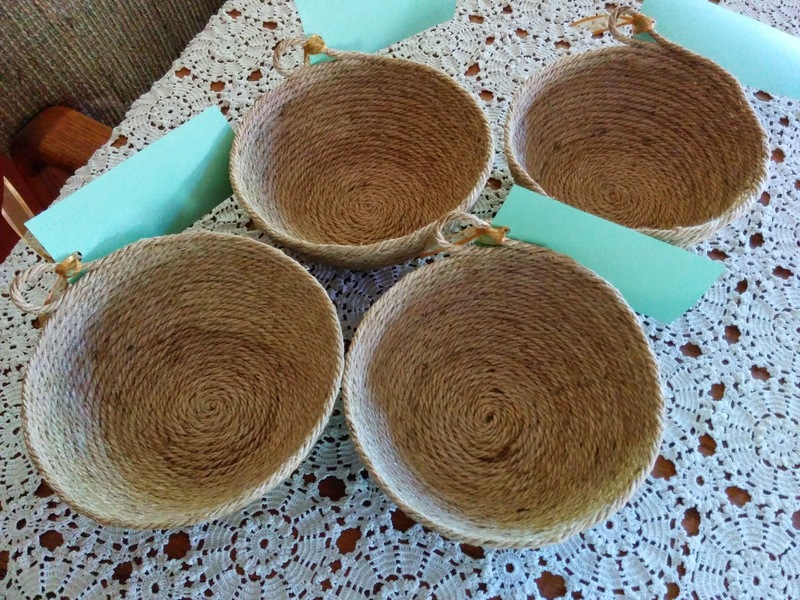 Remove your sisal bowl from the bowl you used as your mold using the ribbons to pull it free. 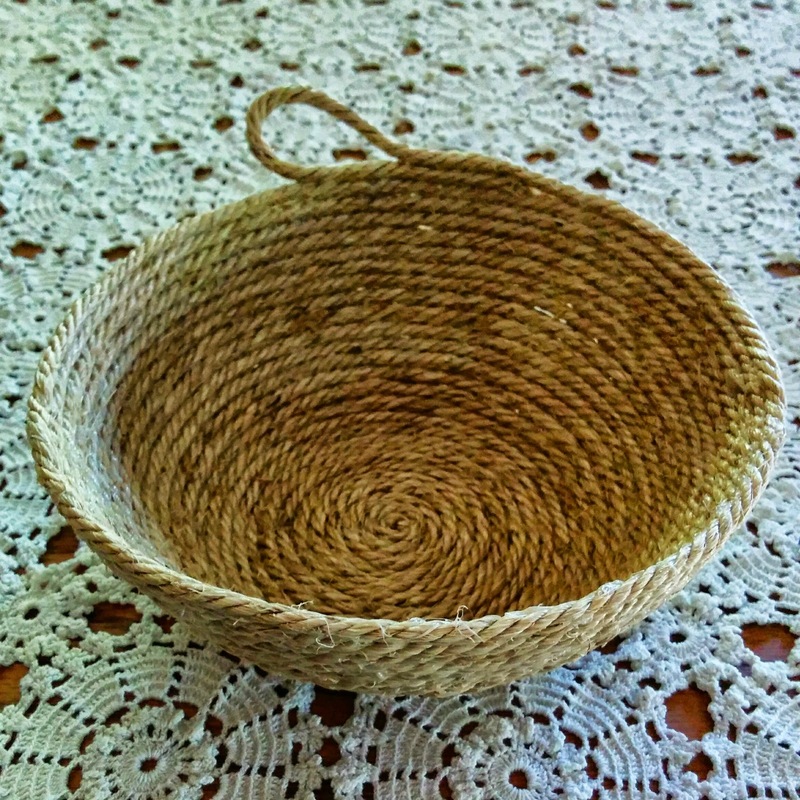 Flip the sisal bowl right side up and generously coat the inside of the bowl with glue. Use the paint brush to evenly spread the glue and let the bowl thoroughly dry. Now decide how you want to finish off the end piece. I decided to make a loop so that the bowl can actually be hung on a hook. I folded the end piece back on itself, trimmed the frayed end and tucked it under the last wrap. I used lots of glue and pins to lock it place. When the bowl was completely dry, I looked for any sharp strings poking out and trimmed them off with the scissors. The last part of my "Pay It Forward" initiative was to put something in the bowl, so I made some Chocolate Chip Oatmeal Cookies this morning. One of my Canadian friends received her bowl in January without the cookies, but I'll make it up to her when she returns to Costa Rica. This afternoon John and I went calling to drop off the remaining 4 baskets and put smiles on faces. If you are looking for a fun family project for a rainy day, or a snow day, this just might be it. Important Note: The sisal rope bowls are NOT waterproof! Holy crap. The only thing I ever made with Elmer's glue was fake fingernails in the groove of my ruler in grade school.